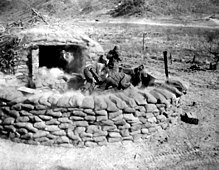 A 4.2-inch mortar in Korea, 1952. The M2 4.2-inch mortar was a U.S. rifled 4.2-inch (107 mm) mortar used during the Second World War and the Korean War. It entered service in 1943. It was nicknamed the "Goon Gun" (from its large bullet-shaped shells, monopod, and rifled bore – like a rifle for shooting Goons) or the "Four-Deuce" (from its bore size in inches). In 1951 it began to be phased out in favor of the M30 mortar of the same caliber. The M2 could be disassembled into three parts to allow it to be carried by its crew. The mortar tube weighed 105 pounds (48 kg), including a screw-in cap at the bottom. The cap contained a built-in fixed firing pin. The standard, a recoiling hydraulic monopod that could be adjusted for elevation, weighed 53 pounds (24 kg). The baseplate had long handles on either side to make it easier to carry; it weighed 175 pounds (79 kg). Upon the entry of the United States into World War II, the U.S. Army decided to develop a high explosive round for the mortar so that it could be used in a fragmentation role against enemy personnel. [c] In order to extend the range to 3,200 yards (2,900 m), more propellant charge was used and parts of the mortar were strengthened. Eventually, the range of the mortar was extended to 4,400 yards (4,000 m). The modified mortar was redesignated the M2. The M2 was first used in the Sicilian Campaign, where some 35,000 rounds of ammunition were fired from the new weapon. Subsequently, the mortar proved to be an especially useful weapon in areas of rough terrain such as mountains and jungle, into which artillery pieces could not be moved. The M2 was gradually replaced in U.S. service from 1951 by the M30 mortar. Starting in December 1942, the US Army experimented with self-propelled 4.2-inch mortar carriers. Two pilot vehicles based on the M3A1 halftrack were built, designated 4.2-inch Mortar Carriers T21 and T21E1. [d] The program was cancelled in 1945. Before the invasion of Peleliu in September, 1944, the U.S. Navy mounted three mortars each on the decks of four Landing Craft Infantry and designated them LCI(M). They provided useful fire support in situations where conventional naval gunfire, with its flat trajectory, was not effective. Increased numbers of LCI(M) were used in the invasions of the Philippines and Iwo Jima. 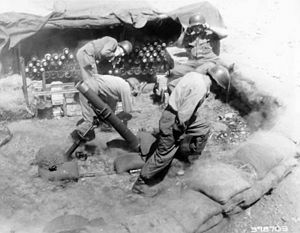 Sixty LCI(M) were used during the invasion of Okinawa and adjoining islands with Navy personnel operating the mortars. 4.2-inch mortars were employed by chemical mortar battalions. Each battalion was authorized forty-eight M2 4.2-inch mortars organized into four companies with three four-tube platoons. Between December 1944 and February 1945, the battalions’ Companies D were inactivated to organize additional battalions. 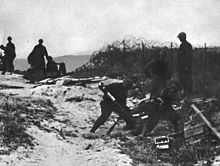 In World War II, an infantry division was often supported by one or two chemical mortar companies with twelve mortars each. In some instances an entire battalion was attached to a division. In the Korean War, an organic heavy mortar company of eight 4.2-inch mortars was assigned each infantry regiment while Marine regiments had a mortar company with twelve mortars. The M2 has a rifled barrel, unusual for a mortar. Thus its ammunition lacks stabilizing tailfins common to most mortars. The mortar's M3 high explosive (HE) shell packed 3.64 kilograms of explosive charge, placing it between the M1 105-mm HE shell (2.18 kilograms of charge) and M102 155-mm HE shell (6.88 kilograms of charge) in terms of blast effect. The mortar could also fire white phosphorus-based smoke shells and mustard gas shells. The official designation of the latter was Cartridge, Mortar, 4.2-inch. Mustard gas was not used in these wars and the U.S. ended up with a large number of these shells, declaring over 450,000 of them in stockpile in 1997 when the Chemical Weapons Treaty came into force. Destruction efforts to eliminate this stockpile are continuing with a few of these aged shells occasionally found to be leaking. ML 4.2-inch mortar – British mortar. 107mm M1938 mortar – Soviet mortar. ^ At the outset of World War II, authorized toxic fillings for American mortar shells were Mustard, Lewisite, Phosgene, CNB (a solution of Chloroacetophenone in Benzene and Carbon tetrachloride) and CNS (a solution of Chloroacetophenone and Chloropicrin in Chloroform). Later, Cyanogen chloride was added to this list. Some measure of the U.S. Chemical Warfare Service's opinion of the relative value of different toxic agents for gas shoots may be gauged from the number of shells filled with various agents from 1940 to 1946: 540,746 contained mustard, 49,402 phosgene, 41,353 CNS, 12,957 CNB, and 175 lewisite. ^ Thermite and other incendiary rounds could also be fired. ^ Experimentation along this line had first begun in 1934. ^ The CWC already had the T81 Chemical Mortar Motor Carriage, based on the M5A1, in service. ^ Chamberlain, Peter (1975). Mortars and rockets. Gander, Terry. New York: Arco Pub. Co. p. 23. ISBN 0-668-03817-9. OCLC 2067459. ^ Bruce Elliott; Rodney Young. "History of the 4.2" Chemical Mortar". www.4point2.org. Retrieved 14 April 2017. ^ Kleber, Brooks E. and Dale Birdsell, The Chemical Warfare Service: Chemicals in Combat, Washington, D.C.: Center of Military History, 1990, pp. 520-533. ^ U.S. Army TM 43-0001-28, p. 4-84, April 1994. ^ Rottman, Gordon L. (2010). Army of the Republic of Vietnam 1955–75. Men at Arms 458. Osprey Publishing. p. 9. ISBN 978-1-84908-181-8. Jane's Infantry Weapons 1984–1985, Ian Hogg (ed. ), London: Jane's Publishing Company Ltd., 1984. ISBN 0-7106-0796-2. Wikimedia Commons has media related to 4.2 inch Mortar M2.